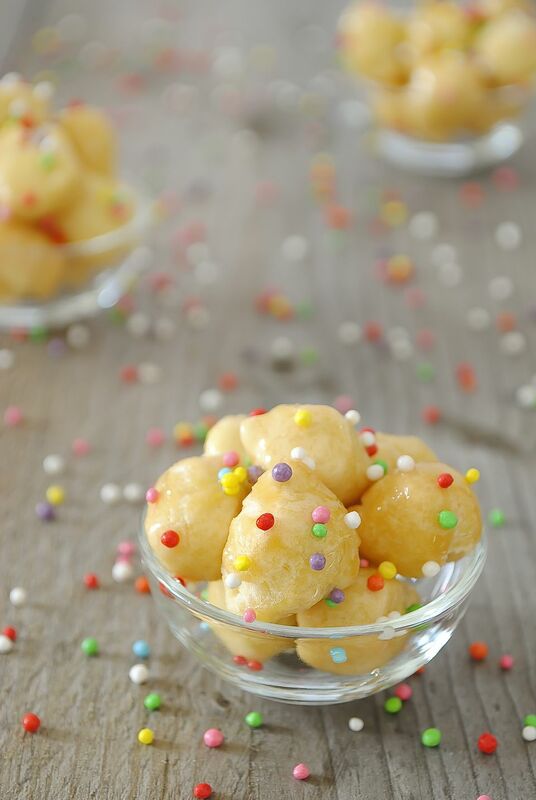 Struffoli, tiny balls of crisp-fried dough, either shaped like a wreath or piled into a pyramid and topped with a honey glaze and colorful candy sprinkles and/or candied fruit, are now an absolute requirement at the end of a traditional Neapolitan Christmas Day dinner. However, in introducing them in La Cucina Napoletana, Caròla Francesconi says their inclusion is relatively recent. They are mentioned several times in an Italian cookery book from 1634 but aren't included in that book's Christmas menu. The recipe for struffoli is quite old, as is indicated by the presence of variations throughout the Mediterranean basin -- they are related to the Lukumates of the Greeks, and also to the Precipizi that Italian Jews make for Hanukkah. Combine the ingredients for the dough to make a workable dough, knead it well, and let it sit for at least 1 hour, covered. Pluck off pieces and roll them out using your fingers to form snakes about as thin as your pinkie, and cut them into 1/4 inch-long pieces. Fry the pieces a few at a time in hot oil until brown, and drain them on absorbent paper. Should the oil start to froth after a bit, and the froth overflow the pot, change the oil. Take a second, preferably round-bottomed pot and put the honey, sugar, and water in it. Boil the mixture until the foam dies down and it begins to turn yellow. At this point reduce the heat as much as possible and add the struffoli and the diced candied fruit. Stir to distribute everything evenly through the honey and turn the mixture out onto a plate. Shape the mixture into a wreath with a hole in the middle, dipping your hands frequently into cold water lest you burn yourself. Sprinkle the candied fruit strips and the diavolilli over the ring and arrange the cherry halves evenly.